It’s almost been a year since I was on here last, which is crazy to me. I feel like this year has sort of been one messy blur. I’ve been working a lot and trying to keep up with my creative side as well. I’ve been lucky enough to have seen some incredible theater this year, one piece in particular which is going to BLOW UP! So get your tickets while you can to Dear Evan Hansen. I saw it off Broadway in May and went to the first Broadway preview this month. It will make you laugh and cry and most importantly let you know you are not alone. Check it out here! Hoping to make more time to keep posting here and updating as much as I can. Look out for some new photos and videos soon! Hope everyone had a wonderful Thanksgiving and that the holidays bring some cheer your way! It’s December already!?! I cannot believe it! I hope everyone had a lovely Thanksgiving. I spent all of Wednesday cooking and baking for my family. My first full Thanksgiving feast done by myself! We packed it all up and went out to Montauk on Thursday, as we usually do, and enjoyed the sweet sounds of the ocean while chowing down on some good eats! The weekend was full of family and relaxation! Wishing everyone a holiday season filled with joy, love and time spent with family! I’ve been working on a new magazine for Optix Family Eyecare and will post once it’s live! Lots of photos to edit, but they will be posted soon! Sweater weather is upon us! I couldn’t be happier! Something about crunching leaves under your boots and wearing a cozy scarf while drinking warm apple cider makes me smile. Summer has been wonderful and I love the sunshine, but I’m ready to watch leaves turn red and drink/eat everything pumpkin! WAITRESS! How do I even begin to explain the beautiful piece of theater that is on its way to Broadway! I took a weekend trip up to Boston to go and see the out of town try out at Boston’s American Repertory Theater two weeks ago to see Waitress (based on the 2007 movie). WOW. Not only was the set perfectly created and incorporated to the show, but the cast. I can’t think of better people to be in this show! Jessie Muller is hands down one of the most talented actresses of our time. What a voice. She puts so much heart into her performance as Jenna. Kerala Settle and Jeanna De Waal also give extraordinary performances as Jenna’s coworkers and two friends. Drew Gehling a personal favorite actor of mine gives a hilarious as well as heartfelt performance as Dr. Pomatter. Each member of the cast gets their time to shine which I love. The music for the show, written by Sara Bareilles is so beautiful. I can’t explain how gorgeous “She Used to Be Mine” is (the big pivotal song for Jenna the main character). The show is so well done and I can’t wait to see it again in March of 2016 when it makes its Broadway debut at the Brooks Atkinson Theater! I have some new photos on the page. My youngest brother Timothy decided to restore our older brothers 1964 Harmony Rocket H4 as a surprise and gift for him. It took about a year of hard labor, putting in as many hours as he could daily to restore it back to its old beauty. He sanded down all of the old chipping paint, repaired cracks, and even rewired the electrics inside to make it sound amazing again. The piece came out beautifully and Lee (older brother) was shocked when he saw it! I am amazed by the two of them on a daily basis. Both have such intense music ability and can pick up anything and start playing it. Timothy is so creative and shows extreme dedication when starting a project. Timothy asked me to take some professional pictures of the finished product, so they are up on the photography page! Take a look! So I said I was working on a short film, and I am finally ready to show it. I am my own biggest critic and I don’t think it’s perfect, but I like how it came out. I may go back to make some edits, but for now I will leave it alone. Go check it out on my film page and let me know what you think! ALL critiques are welcome! Personally I have just been working and trying to fit as much as I can into my weekends. Commuting is definitely tough and tiring, but it will get easier I’m sure. Holidays are coming up so lots of baking to do! That cookbook is still in the works, but just taking some time to compile and edit recipes/match up pictures to each recipe. Hoping to see some sort of final product by next year! Hope all is well with you guys! Enjoy the end of summer and the beginning of Fall! I’ll be back to update soon! The sun is back! Can you believe it!? I never thought I would see the grass in my front yard again. But its back, bright green, and thriving in the beautiful weather we have been having! One of my dear friends that I met during my internship at The Tonight Show called me up to ask if I could be an art director for an NYU thesis film she was producing. The piece is called Younger (written and directed by Jameson Rich) and it is such a beautiful story. I’ll post the link when the piece is in its final state! I was so happy that I got to accept the offer and spend a few days on set helping out with the art department as well as do a photo shoot on set both days. (I’ll post a few of those pictures once I get them!) It was such a great feeling to be back on a set and surrounded by people all working toward the same goal. I’ve been doing my theater rounds as well and have some exciting Tony nominated (soon to be winners I’m sure) shows coming up! I did see An American in Paris and just wanted to say BUY YOUR TICKETS RIGHT NOW!! What a beautifully choreographed show. The talent on stage at the Palace Theater is insane. It should literally be illegal to have that many talented people in one room! Everything from the lighting design to the sets and the orchestrations are just incredible. The show is worthy of every single nomination they got, and I truly hope they sweep the Tony’s this coming Sunday! In film news I just watched a great documentary about YouTubers! It’s called Please Subscribe by Dan Dobi. As a YouTube fanatic and dedicated user since 2005 (has it really been 10 years already!?) it was a lot of fun for me to get to hear how a lot of these well known YouTubers got their start. It is definitely worth the watch, and is on Netflix (super convenient!) I also recently watched Beyond Clueless by Charlie Lyne. The documentary chronicles favorite teen dramas from the 80’s through the present day. It goes through what makes them work and why we end up loving these cult classics such as Pretty in Pink and Clueless. If you love these kinds of movies, this documentary is worth a watch! I am working on an experimental video of my own right now! I downloaded Adobe Premier and have 30 days to learn it/complete the film before my trial expires. I love a challenge so BRING IT ON!! It’s called Morning Light. It all sort of came to me when I was leaving for work early one morning and I passed my brothers room. I looked in for a second and the light and shadows from the tree outside his window were so beautifully bouncing on his blinds that I dropped everything and took out my phone and started filming. As cliche as it sounds, to quote Ferris Bueller, “Life moves pretty fast. If you don’t stop and look around once in a while, you could miss it.” And if something hadn’t willed me to stop and look in his room I would have missed that gorgeous moment. So it got me thinking about the morning and those special moments when you first open your eyes and you’re squinting at the small beams of light bursting through your window. Or when you get in your car and the morning dew is dripping slowly off of your windshield. So I’m making a film. I hope to have it done by the end of next week, but we will see how busy next weeks schedule is! I’ll post it here when its finished! I’ve got pictures on the way from a craft fair I went to with my parents a few months ago, and a few from Mothers Day/my Mom’s birthday celebration! Keep perusing your passions and enjoy the delightful weather on the way! Side Note: I haven’t forgotten about the cookbook! I’m still in the stages of compiling my recipes into a binder and picking the ones I really think are worth a share! Hope to have a hard copy by the end of this year! It’s a work in progress! How many days until Spring!? Sick and tired of the snow yet, I know I am… It has been so cold and so snowy… I don’t think I can handle much more of it! Who is moving to Spain with me? Anywho, just stopping by to give a little update to the site! New pictures are up under the photography tab! Had a fun photoshoot with my younger brother today! His girlfriend is doing a drawing project focusing on hands and needed pictures, so it was the perfect excuse for a shoot! Any and all feedback is welcome! It’s been a while and I finally have some time off to send out a little update on life! Other than that I’ve been keeping up with the knitting. My friend from England sent over this awesome link to a video which teaches you how to knit using your arms and hands as the needles! I picked it up last night and I am OBSESSED!! You can teach yourself here, (http://creativity.viralnova.com/arm-knitting-scarf/) it’s so much fun! I haven’t been doing a lot of cooking or baking as of late. Not enough hours in the day to do it all, but I did put together a binder of all of my recipes. Slowly but surely the cookbook is coming together! Thats all I’ve got for now! Hope you are all fabulous! Until we meet again! I hope everyone enjoyed a wonderful day filled with family and lots of delicious food! For me Thanksgiving means Montauk! My family and I rent a condominium on the beach (for the past three years) and we spend Thursday to Sunday enjoying the calming roars of the Atlantic Oceans waves crashing on the shore. This year I cooked and baked most of the meal (my mom of course led me through the turkey instructions and made a bunch of delicious side dishes!) This is my first vacation since I came back from England, almost two years ago. I am so happy to have nothing on my mind for 5 whole days! I’ve put up a few photos from today in Montauk and there will definitely be more to come! Enjoy the holiday weekend! Absolutely loved this episode. Although I was crushed to see my favorite character Hook fall into the horrible games of The Dark One, I am glad that Emma is safe… For now. Once has become what Desperate Housewives used to be, our Sunday family show. Love spending Sunday nights with my parents and some good TV! This Sunday on Once Upon a Time, just as Elizabeth Mitchell foretold, the ABC drama served up a “sweeping, epic” two-hour episode — and one of the series’ very best since the pilot. 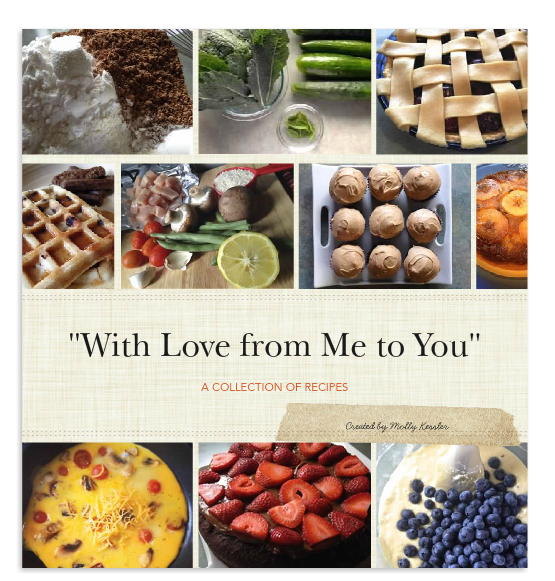 For a long time coming I’ve been meaning to compile all of the recipes I have either created myself or borrowed and changed from friends, family, or websites and turn them into a book! I have been asked over and over by friends for a book filled with the recipes that created such mouth watering Instagram photos. The other day I started going through pictures I’ve taken, created a cover, and found a name! “With Love from Me to You” not only a Beatles lyric but the perfect title. In this book I intend to give my friends and family the recipes I love and think they will love. With Thanksgiving around the corner I have a lot of baking and cooking to do! I’m hoping that this book can be finished around Late January or early February! Here is a sneak peak at the cover of the book! Stay tuned for updates! Hello there! My name is Molly Kessler. I am a graduate of Marymount Manhattan College in NYC. I hold a Bachelor of Arts Degree in Communications/Creative Media and aspire to one day be a television producer. I just want to welcome you to my site, give you a little info on me, and what you can expect to see here when you pop by next! I am an avid social media user. Since the dawn of Facebook’s popularity (and me being old enough to use it) I have been posting status updates (some with a little too much information), sharing photos, interesting articles, and of course connecting with friends. In my case friends around the world thanks to my 2013 study abroad program! I’ve been tweeting since ’09 and joined Instagram before it was the cool thing to do. I have a hipster looking bowl of mac and cheese on there from 2010 to prove it! LinkedIn has become one of my new best friends as well and I think that pretty much covers it! When I’m not glued to my phone or computer I am either in the kitchen or binging Gilmore Girls on Netflix while drinking a very large cup of coffee and bundled up with a new knitting project! My friends and family have come to expect food pictures on their news feeds at least twice a week. (It is usually more and I have no shame at all!) On my days off from selling merchandise on Broadway, I love to bake and try out new dinners. You can always tell when I’m home because the house smells like muffins or cookies when you walk in the door! Being home from college and having a stocked fridge gives me the advantage of making outrageous meals and different concoctions that my small apartment in NYC didn’t really grant me. (and my mom doesn’t mind coming home to dinner already done either!) I love to take apart recipes and make them healthier, finding alternative ingredients and different techniques to make the next batch even better! In the coming year I am hoping to get my act together and finally make that cookbook that I’ve been talking about for years! That’s me. The basic outline at least! With the holidays coming up I know work is going to get a little crazy, but I hope to be on here updating and sharing as much as possible! Thanks for stopping by and I hope to see you back soon!